Squadron Leader James Joseph “Orange” O’Meara DSO, DFC & Bar was a Battle of Britain Spitfire Ace with 11 kills, two shared victories, one unconfirmed destroyed, four probables, 11 damaged and one shared damaged. O’Meara was born in Barnsley, Yorkshire on the 20th February 1919. Having had an early passion for aviation he started taking flying lessons at the age of 17 and obtained a pilots licence with the Norfolk & Norwich Aero Club on 19th June 1937. He entered the Royal Air Force on short commission in April 1938 at the age of 19 and was confirmed as a pilot officer on 4th April 1939. 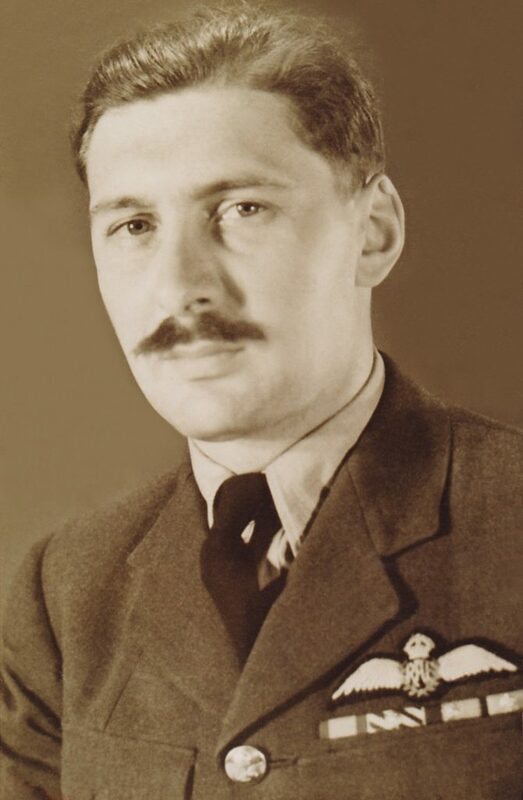 On the 18th June he was posted to 9 FTS, RAF Hullavington. O’Meara’s First operational posting was to No.64 Squadron on Spitfires based at Hornchurch, East London with whom he obtained his first ‘kill’ while over Dunkirk on 31st May 1940, when he brought down a Bf. 109. He had already damaged a Ju. 88 while patrolling off Calais the previous week and over the ensuing months the Luftwaffe would suffer heavily through his marksmanship. His next victim was another Bf. 109, shot down in flames over the channel on the 19th July and ten days later, while intercepting a raid over Dover, he sent down a Ju. 87 into the sea. Moments later, he damaged two more, one of which caught fire. On the 11th August he seriously damaged one Bf. 109 and destroyed another and on the following day damaged yet one more. Then on the 15th he had another Bf. 109 confirmed as destroyed and on the 18th, he damaged a Ju. 88. O’Meara was shortly afterwards posted to No. 72 Squadron at Biggin Hill and quickly got back into his stride, downing a Do. 17 on the 27th September. A richly deserved D.F.C was approved by Dowding the same month. His citation in the London Gazette read: “Pilot Officer O’Meara has displayed a very high degree of skill and devotion to duty in all operations against the enemy and has destroyed at least six enemy aircraft. His example and keenness have been outstanding”. He was then sent for a ‘rest period’ at 421 Flight at Hawkinge, working up new Pilots who would eventually form the nucleus of No.91 Squadron. Not wanting to waste any time in this new posting, and no doubt keen to instil some confidence O’Meara took up his high performance blue-painted Spitfire and shot down an He. 59 on 26th November, a Bf. 109 that was attacking one of our Minesweepers on 5th December and then damaged another one immediately afterwards. On the 18th March 1941 O’Meara was awarded a bar to the DFC approved by Leigh-Mallory, the citation published in the London Gazette reported that “This officer has performed excellent work as a fighter pilot in the many and varied missions which have been allotted to him. On a recent occasion he led an offensive operation which extended as far as Holland, and in which troops and a gun-post were machine-gunned; an armed ship was also attacked. Flying Officer O’Meara has now destroyed at least eleven enemy aircraft. He has set an excellent example”. By April 1941 O’Meara had been appointed to the command of No.131 Squadron at Castledown, he had, in the meantime, destroyed another He. 59 and temporarily returned to No.64 Squadron as a Flight Commander. O’Meara flew with 131 over the next year, flying 170 sorties, claiming an He. 59 and a Bf. 109 and bringing his score to at least 12 confirmed victories. Recommended by his Group Commander for a Second Bar to the D.F.C., Leigh-Mallory approved a D.S.O. instead, his length of uninterrupted active service warranting higher recognition. His citation, published in the London Gazette stated that “Squadron Leader O’Meara has completed a notable tour and throughout has displayed a high degree of skill and gallantry. His genius for leadership has been most evident and has contributed in a large way to the operational efficiency of the squadron he commands. He is a relentless fighter and has destroyed 12 enemy aircraft and damaged many more”. O’Meara left the RAF shortly after the war but rejoined as a Flight Lieutenant on the 3rd January 1950 and was granted a permanent commission as Squadron Leader on the 1st October 1953, he went on to fly Gloster Meteor and Javelin fighter jets. He remained with the RAF until his retirement on the 31st July 1959. O’Meara married twice and had 2 daughters with his first wife and a son with his second wife. He became a hotelier and died in Barnstaple, Devon in 1974 and is buried in the Old Town Cemetery in Bideford, North Devon.